On September 7th of last year my husband, Bill, collapsed on the side of a mountain road with what would later be diagnosed as a ruptured brain aneurysm. On September 9th our daughter, Pam, and I made the gut-wrenching decision to discontinue all life-support and two hours later my beloved was gone. Five months have passed since my life was turned upside-down and inside-out. During that time I have not written on my blog. I chose today to start writing again, because February 21st is Bill’s birthday. He would have been 70 years old today. It seemed a perfect time to begin again. After all, there would never have been a blog or a novel had it not been for his constant support, guidance, direction and yes, sometimes, his nagging voice pushing me forward. It’s not that I haven’t written anything since his death, it’s just not writing that is for public consumption. It’s journaling for my eyes only, for the purpose of working through my grief, because that’s what writers do. We write when our hearts are broken, we write when great joy fills our days, we write no matter what life throws at us. We grapple with life’s events, work our way through them, by writing. So, I have a very short and simple message for today. I encourage you to try your hand at journaling. It’s a cathartic healing exercise which doesn’t require proper grammar or spelling or any sort of logical progression of thought. It’s just your mind moving a pen in your hand across a piece of paper and releasing thoughts and emotions onto the page. Try writing three or four pages without stopping. You’ll be amazed at what comes pouring out. Although I am committed to writing on my blog on a more regular basis, there may be a shift in focus as I work my way through this journey of grief and healing. Stay tuned. When I wrote My Darling Dorothy, I chose words with great care. Unfortunately, I didn’t transfer that care into the marketing aspect of this project. For the past two months, I have been soliciting reviews of My Darling Dorothy with little success. It turns out that, for most people, the word “review” evokes a great deal of fear and trepidation. Visions of having to write a 300-500 word professional assessment complete with a summary of the story, a description and assessment of character development, story flow, and what you did and did not like about the book with quotes from the book to support your statements are conjured up in the mind of the person beings asked to do the review. I realized, after some deep thought on the subject, that a better word to describe what I am asking for is “rating.” Amazon and Goodreads both allow readers to rate books with one to five stars depending upon how well they did or did not like the book. Adding a few words regarding why they gave the novel that particular number of stars completes my request. The key phrase is, “a few words,” not a full professional review. One last area I have uncovered that prevents people from writing a review is that they fear being honest. They don’t want to hurt the author’s feelings, so they figure doing no review is better than giving the novel a bad review. It turns out that this isn’t true. The mantra amongst all book-marketing professionals has been, in my experience, “reviews sell books.” Readers choose novels to read based on a variety of ratings, not just four and five-star ratings. As a matter of fact, it begins to look suspicious when a novel receives no 1-3 star ratings. Our mothers were right; you can’t please all the people all the time. It is only fair, however, especially when giving a low rating, that a few sentences are included regarding why that rating was given. Accepting low ratings was not an easy thing for me to embrace. I would much rather people kept those opinions to themselves. Who wouldn’t? On the other hand, if low ratings outweigh high ratings, it is a clear message to me that I have some work to do. In the end, I value honesty over false praise. The bottom line remains that I am looking for honest ratings/reviews posted on Amazon and/or Goodreads in an effort to sell more copies of My Darling Dorothy. If you haven’t read it yet, you are in luck. Click on the website listed below and you can download a free copy of this wonderful story. A frequently asked question at book club gatherings is, “How do you write dialogue?” The quick answer is that I don’t write dialogue, the scene dictates the conversation and the words flow. The truth is that I have conversations in my head all the time; between my husband and me, a friend and me, or before I retired, my boss and me. I finally learned that the conversations were really my super-ego talking to me about some imagined shortcoming. The super-ego, being the tricky entity that it is, always disguises itself as a person in my life. So, in the case of having an imagined conversation with my boss, he would ask me why I hadn’t finished a report or what I was doing to increase our efficiency. I then had to defend myself and, as embarrassing as this may sound, I could actually work myself into a tizzy, becoming angry and defensive, when in reality the entire event took place in my head and nowhere else! When I began writing My Darling Dorothy, I found dialogue fairly simple to write. It didn’t take long for me to realize that I had learned the skill from those many years of conversations with my lovely super-ego. The other method I employ when writing dialogue is to imagine I am watching a movie. In the case of My Darling Dorothy, I imagined scenes from films made in the 1940’s. Watching the characters sweep across the big-screen in my mind is a rather entertaining exercise and provides splendid fodder for dialogue development. The more challenging skill is learning to balance narrative with dialogue. Sometimes it’s easier to express an idea through dialogue, but sometimes a narrative is more appropriate. I find knowing when to move from dialogue to narrative is easier to do in the editing process than while I am writing the first draft. Reviewing the dialogue as part of the flow of the entire chapter allows me to more clearly determine if it is appropriate. If I decide it isn’t working, I can then either switch to more narrative or, in many cases, delete the scene entirely. Even in scenes where the dialogue is deleted, I find the exercise of writing the conversation helps clarify what I am trying to accomplish in the scene. I ask myself if it deepens the reader’s understanding of who the character is, or for that matter, does it deepen my understanding of the character? This has been a brief explanation of my process for writing dialogue. I would welcome hearing from other writers about their technique. In the meantime, I think I’ll go have a glass of wine, close my eyes, and listen to the ongoing conversation/movie in my head that just might lead me to my next project! I have been so busy enjoying my virtual blog tour that I have neglected my own blog. 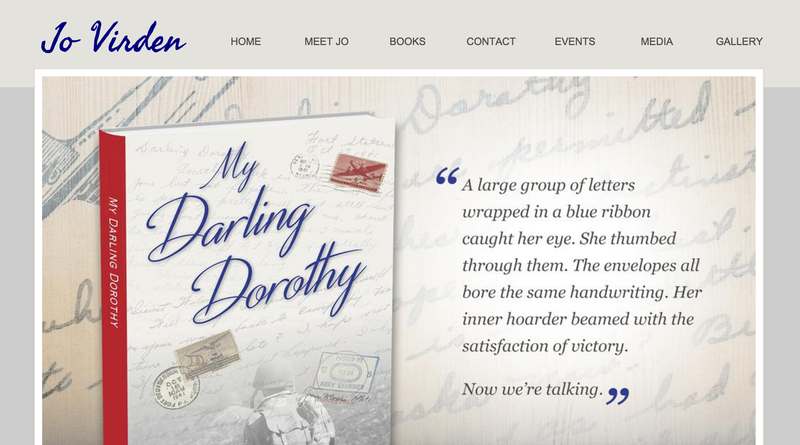 It has occurred to me that I need to share the marvelous reviews that MY DARLING DOROTHY is receiving from bloggers in Arkansas, Florida, New York, New Jersey and Virginia. I will be posting each of them on my website at jovirden.com. Take a look! Over the years, I have come to realize that there are two kinds of writer’s block. The first kind can cripple writers and prevent them from ever writing again. The second kind is what I usually grapple with. It’s wanting to write, thinking I should be writing, feeling guilty because I’m not writing, and being unable to settle my mind enough to write. Eventually, though, I do end up writing something. Some call this force their muse. This is an ancient word dating back to the fourteenth century. It is thought of as a goddess or creative power that inspires artists. Mythology credits Zeus and Mnemosyne for birthing nine daughters, each one presiding over a specific art form and providing creative power to the artisans therein. She becomes their muse. Call it what you may, this creative force is available to everyone and needs only an opening in the mind to do its work. That opening, I believe, exists in the subconscious mind. My job is to open myself to the suggestions and ideas that exist in this subconscious, creative arena. The question then is how to accomplish this feat. The ways in which this is done are as varied as the seven billion people that inhabit this planet. I walk or clean my house or futz around in my garden. Others may run or hike or daydream. It doesn’t matter how the creative energy is accessed. It only matters that one makes the effort to open oneself to its possibilities. There is one exercise I would encourage everyone to try. Meditation is a powerful way to open the creative channel. When we meditate we let go of our ego, our preconceived ideas and thoughts and we simply stay quiet and receptive to the moment. I very seldom have inspired thoughts during meditation but what I do have is a few moments of rest from the monkey-mind chatter that goes on in my brain. That quiet time alone provides an opening for subconscious ideas to surface. If I follow meditation with journaling, the ideas begin to flow and I know the muse is with me. Then my only job is to listen with an open mind and transcribe. I would suggest that every writer, and anyone who feels creatively blocked, give up the idea that you are the one doing the creative work and open your mind (and your heart) to the idea that you are a part of a universal creative force. Meditate on that and watch the magic begin.